John’s presentation focused on the transition from a Design-Bid-Build to Design Build is changing the traditional relationship between designers, contractors, and owners. Increasingly projects of all types and scales are turning to alternative delivery methods to reduce liability, build faster, and control costs more effectively. In looking forward, he emphasized how important it is to recognize that as Design Build becomes more prominent in our industry, the landscape architect is forced to adapt as roles change, design priorities shift, and the design process transforms. Other panel speakers included, Dorothy Faris, Brian Aske, and Vinita Sidhu. Read the details about this installation in the news post below. 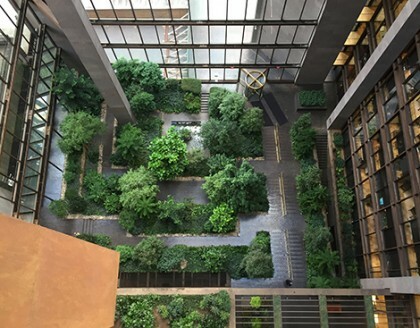 SiteWorks, in collaboration with Raymond Jungles, Inc. (RJI) and Gensler Architecture, has finished installing the interior Atrium garden at the Ford Foundation for Social Justice. The garden, designed by RJI, was renovated to restore famed modernist landscape architect Dan Kiley’s vision of a New England forest in the city. SiteWorks provided technical consulting for the interior planting environment; assisted with coordination of plant procurement, irrigation, and fountain and soils improvements; and provided, constructability reviews, and construction administration services. SiteWorks also created a Maintenance + Operations manual which covers all maintenance activities, interior environmental conditions, potential pests and diseases, and record keeping and documentation. 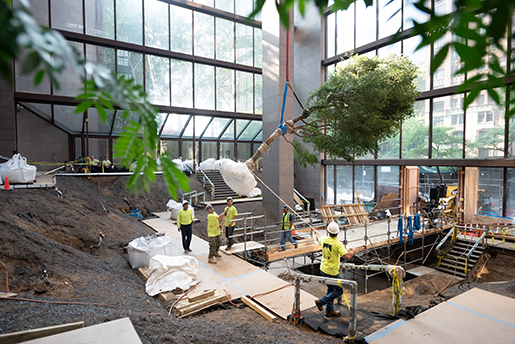 SiteWorks will continue to provide maintenance and horticultural oversight of the Atrium as the plants acclimate to their new environment. SiteWorks Partner, Andrew Lavallee, has two upcoming speaking engagements. 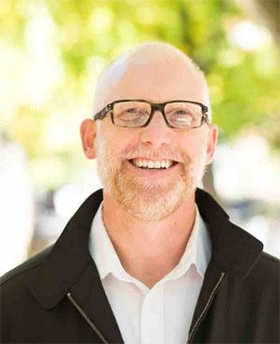 He will be speaking at the Rising Urbanists Conference: Reframing the Urban Forest on Saturday, March 30, 2019. 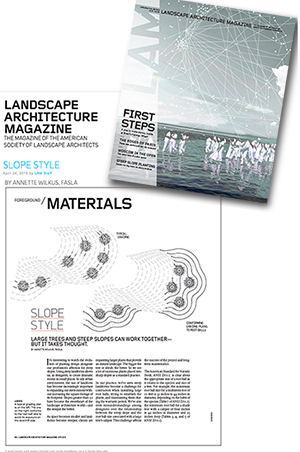 The conference is sponsored by the ASLA student chapter at City College of New York. He will be a panelist on a session entitled “NYC Understory: Novel Ecosystems for Resilient Urban Forests” that will be moderated by Dr. Marcha Johnson, ASLA from NYC Parks. He will also be speaking at the 2019 ASLA Kentucky/National Association of Olmsted Parks Conference in Louisville on Saturday, April 12, 2019. He will be presenting a talk entitled “Enduring Landscapes from Concept Design to Maintenance and Management”. His talk will feature some of our firm’s Operations and Maintenance Planning projects. Life Insurance for Plants; Who’s Responsible When a Plant Fails? by Andrew Lavallee, FASLA, and SiteWorks Partner. 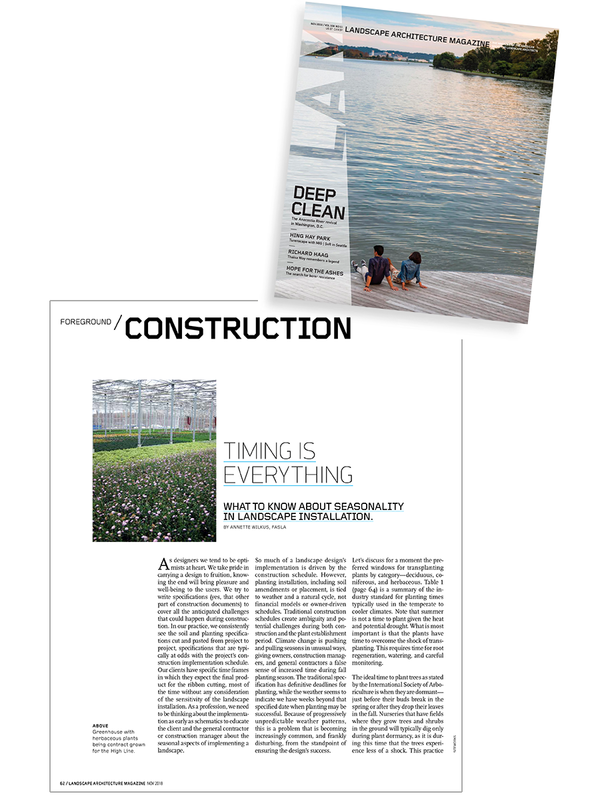 In the February 2019 issue of Landscape Architecture Magazine, Andrew’s article focuses on the challenges of plant warranties, and discusses practical ways to improve outcomes. Hunter’s Point South is a new 5,000 unit mixed use residential project on approximately 30 acres of prime waterfront property in Long Island City, Queens. The project includes some 17 acres of new streetscapes, open space, and a waterfront park. The project has been undertaken in two phases, with Phase 1 completed in 2013 and Phase 2 in 2018. SiteWorks served as Resident Landscape Architect during Phase 1, performing constructability reviews during the design development and construction document phases and working on site for the park and open space area build-out. Working closely with the resident engineer and design team, we developed detailed cost estimates for the park prior to bidding and helped with difficult construction and scheduling issues related to the waterfront edge fence, play equipment, kebony decking, rain garden construction, and custom furniture design. Other park elements include a large oval synthetic turf playing field, waterfront esplanade, children’s play area, dog run, and sandy beach. Due to our valuable input during construction of Phase 1, SiteWorks was asked to join the design team for Phase 2. Our Phase 2 role included detailed constructability reviews and construction support services, as well as the development of a Maintenance Guidebook. 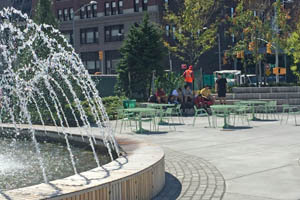 The Guidebook provided annualized maintenance tasks and staffing month by month to help NYCDPR project staffing and skillset needs throughout the year, as well as a projected life-cycle estimate for the waterfront park facilities used to calculate the annual capital maintenance fund contributions needed to support the project’s 40 year design life. Both the O+M budget and capital maintenance fund calculations were used to secure real estate financing from the site’s future residential development. 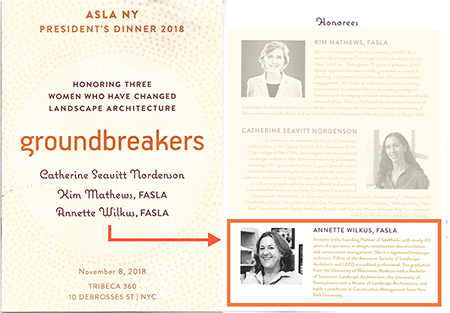 Founding Partner Annette Wilkus was honored by the NY Chapter of ASLA at the annual President’s Dinner with the President’s Award for Service and Leadership November 8, 2018. She, along with two other women, was honored for their Ground Breaking contributions to landscape architecture. Annette was recognized for starting a firm dedicated to the technical aspects of the profession and the implementation of innovative designs. Annette was a member of a panel entitled Enduring Landscapes: Stewardship from Concept Design to Maintenance and Management. The panel addressed the maintenance and management strategies beginning with design and construction documentation (Tom Ryan); followed by examples of working closely with the design team to assess design and maintenance needs (Tim Marshall) and Annette’s portion presenting 3 examples of Operations and Maintenance Manuals of different sizes and client type. Andrew and Annette were members of a panel along with Raymond Jungles and Guy Champin of RJI entitled: The Ford Foundation: Restoring Dan Kiley’s Design and the Challenges Met. The panel presented the in-depth research and analysis RJI did for the plant palate (Raymond Jungles and Guy Champin), how, as a team we, along with Jim Urban, decided to address the difficult slopes of the site using the Missouri Gravel Method to bareroot the trees while they were acclimating under a shade house in Florida (Andrew Lavallee), and the implementation of the project under difficult logistics and schedule (Annette Wilkus). As a design team we strove to recreate Dan Kiley’s design intent with suitable plants and innovative ways to address the steep slopes and environmental issues. The Lower Plaza at Roberto Clemente State Park in Bronx, NY opened to the public on Saturday, May 26, 2018 – just in time for Memorial Day Weekend. After roughly 18 months of closure, park patrons will once again be allowed entry for picnics and barbeques. The inviting new space features nearly 100 outdoor tables and two dozen barbeque grills. Much of the site furniture is universally accessible. Other finishes include three dozen new shade trees and a totally unique paving pattern inspired by the skin pigments of a frog! SiteWorks oversaw construction of the plaza providing a daily on-site presence to link the design consultant, contractors and construction manager into a cohesive team. Painstaking effort was made to ensure design implementation right down to the individual concrete paver — each and every one was correlated to the plan as it was laid. In addition, SiteWorks also served the project by managing the installation of trees and shrubs every step of the way. The firm selected quality plants at the nursery, inspected them upon delivery, and supervised their installation to uphold the standards put forth in the contract documents. The end result is an exciting new “back yard” where the community will grow and thrive. 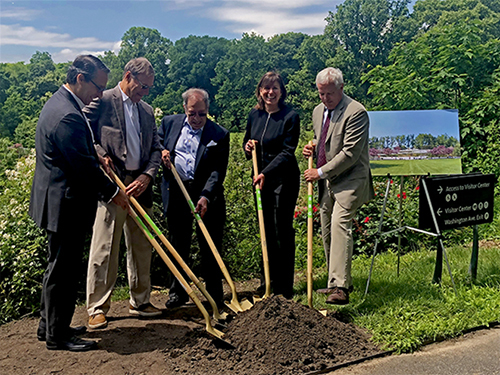 Groundbreaking for the Robert W. Wilson Overlook at Brooklyn Botanic Garden took place on June 6. The opening will be in the summer of 2019. One of the Garden’s most significant undeveloped sites, the Overlook encompasses a 1.25-acre area with sweeping views over Cherry Esplanade and the Garden at large. Taking design cues from the adjacent Diane H. and Joseph S. Steinberg Visitor Center the new Robert W. Wilson Overlook will be reimagined, reconstructed, and replanted in its entirety to create an immersive landscape that amplifies one of BBG’s most extraordinary vistas. As the Landscape Architect for the project, SiteWorks worked closely with Weiss/Manfredi Architects and Toby Wolf Landscape Architect to complete and coordinate the construction documentation expanding the Garden’s botanical collection and bringing functional reverence to an overgrown slope fronting one of its most notable spaces. The planting design by Toby Wolf including the crape myrtle species seeks to complement the design of a universally accessible pathway that provides connection and a continuous circuit between the Overlook, the Visitor’s Center, and the Cherry Esplanade. The flowering crape-myrtle trees are an immersive four-season planting scheme of ornamental grasses and perennials. In seasonal counterpoint to the Garden’s famous spring cherry blossom display, the crape-myrtles offer a spectacular floral show of whites and pinks in late summer, vibrant foliage in the autumn, and intricately textured and patterned exfoliating cinnamon bark that extends their visual appeal into the winter. The grasses and perennials will combine to form a robust, resilient ecosystem that evolves over time, inviting a diversity of insect life and stabilizing the soil to prevent erosion. Parametric walls designed by Weiss/Manfredi move sinuously across the landscape and were carefully studied – along with the topography with which they are intimately linked – with multiple iterations. SiteWorks challenged the initial budgetary constraints, ultimately convincing the team to pursue a system of precast concrete wall segments. This material change simultaneously streamlines the installation of the projects physical structures and lessens the severity of the proposed slopes facilitating a more robust and viable planting strategy. Utilizing best practices, SiteWorks led the proposal for re-use of existing soils, amended to respond to the topography. The moisture regimes were carefully coordinated with the planting palette that was ultimately developed. In May, Andrew Lavallee participated in a multidisciplinary Value Engineering Study at the New York City Office of Management and Budget. The VE Study focused on strategies to improve the New York City Department of Environmental Protection Green Infrastructure Program. SiteWorks Founding Partner Annette Wilkus, FASLA presented at New Jersey ASLA’s 2018 annual conference in February. 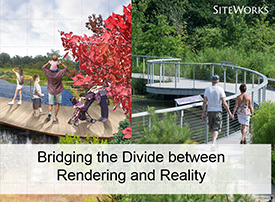 The topic of her presentation was “Bridging the Divide between Rendering and Reality”. Expanding on our successful ASLA national presentation – Inside the LA Studio-Annette spoke to how “We Have to Think Differently” when it comes to the delivery of the project and continued stewardship after the construction is complete. As a profession we often focus on the design and the associated renderings to sell the project many times missing the importance of cost modeling, peer reviews, maintenance manuals and construction administration as key elements to the success of the project. Speaking to “ice berg theory” – or “a lot more happens to achieve what you see” theory, Annette expanded on the need for communication early and often with the client, supporting design professions, construction managers, contractors and the maintenance crew. Additionally, understanding how the design will be constructed is a critical portion of the design process. 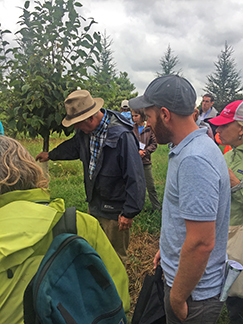 Understanding access to the site, seasonality and how it applies to soil installation and planting seasons is critical to the success of the project. 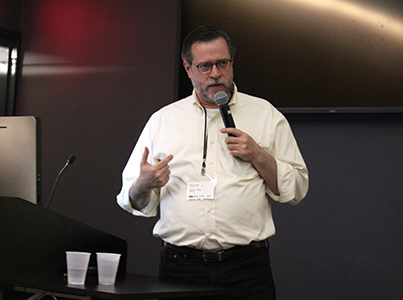 Andrew participated on a panel discussion at the second annual Urbanist Rising Conference in New York City on April 6th. 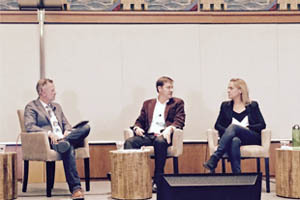 The panel discussion was entitled “Redefining Resiliency for Inclusion” and was moderated by Landscape Architecture Magazine editor Brad McKee. Panelists also included Cornell Professor Josh Cerra and Dr. Marcha Johnson from New York City Parks. Andrew Lavallee spent a day as a guest lecturer at Cornell University February 7th. In the morning he participated in a studio critique for graduate program’s Climate-Adaptive Design Studio. He gave a lunch time lecture to a joint gathering of graduate and undergraduate students and faculty entitled “Rendering Reality”, describing the unique nature of SiteWorks’ practice. He also gave an evening talk on the development of his career for the Landscape Architecture Professional Practice class. Annette and Andrew were featured at a special session at the ASLA National meeting in Los Angles in October entitled “In the Studio with SiteWorks”. The event was hosted by Laura Solano, principal at Michael Van Valkenburgh Associates. Annette and Andrew discuss the history and philosophy of the firm as a specialty landscape architectural practice focused on design implementation, cost planning, pre-construction services and stewardship strategies. 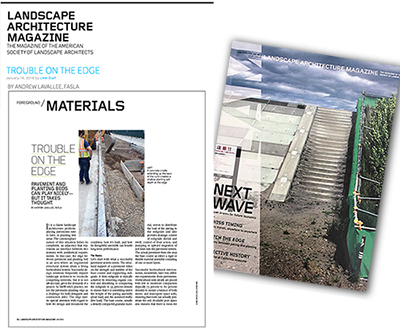 Their talk emphasized how the profession needs to think more broadly about how projects are conceived and executed to deliver higher performing landscapes over the long-term. 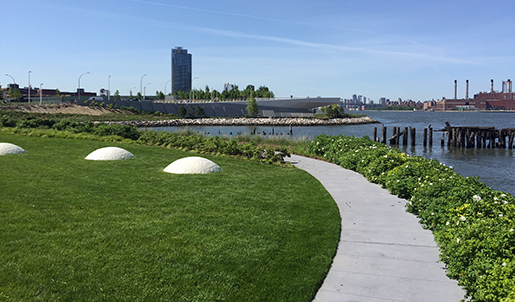 In October, SiteWorks as a member of the CTA Architects project team, oversaw the completion of the Irish Hunger Restoration project at Battery Park City in lower Manhattan. The half-acre Memorial is a 0.5 acre commissioned work of art that includes an undulating landscape over a sloped and cantilevered concrete roof structure. 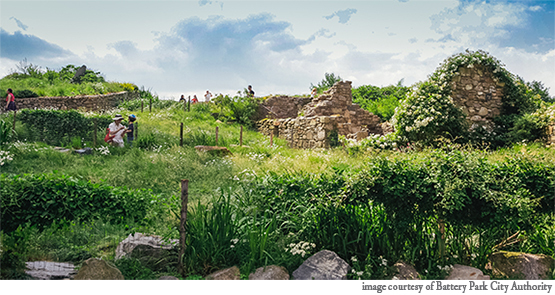 The landscape was conceived as a depiction of an Irish Famine Era cottage situated among abandoned agricultural fields. Originally built in 2002, rapid deterioration of the rooftop structure demanded a full scale renovation that included the full-depth removal of the roof’s structures, soils, and plants to provide an extensive replacement of the building’s waterprooﬁng. In 2012, SiteWorks was engaged to complete a re-design of the memorial’s landscape and provided construction administration oversight for the repair of the building roof. Rigorous photo documentation, consultation with the memorial’s original design team and a carefully sequenced removals plan was developed to ensure that the original design intent was preserved. The design of replacement plants, soils, paving, irrigation and other site features were prepared for reconstruction. SiteWorks altered the original design of the soils to improve plant vigor, and at the same time altered the surface and sub-surface grading of soils to improve internal drainage and promote swift removal of excess storm water from the roof structure. Replacement plants were contract grown in Oregon and air-freighted to the job site. SiteWorks staff directed the layout and installation of more than 46 species and 12,000 plants. SiteWorks Partner Andrew Lavallee, FASLA joined Frances Halsband, FAIA of Kliment and Halsband Architects, Elissa Hoagland of HR&A Advisors, Signe Nielsen, FASLA of Mathews Nielsen Landscape Architect and NYC Parks Commissioner Silver at the Urban Design Forum’s “Valuing Urban Parks” to lead a discussion on new strategies about how to rethink design, revenue generation and public financing to better serve routine maintenance costs for New York City’s public neighborhood parks. New York City’s newest signature parks are largely funded through a mixture of philanthropy, corporate sponsorships and captured value from adjacent real estate. While these strategies have proven to be effective, they are not viable for existing parks in low- and middle-income neighborhoods. The discussion included a review of smarter design strategies, concession agreements, as well as budgetary and tax restructuring approaches to bottom-line routine maintenance costs for these important open spaces. Andrew’s contribution to the discussion, developed in collaboration with Jamie Maslyn Larson, RLA Partner at Wagner Hodgson Landscape Architects, included a review of current maintenance costs associated with a variety of park typologies as well as strategic approaches to design and O+M that include careful programming, fiscal modeling and open space plans that enable effective open space maintenance management on a park by park basis. 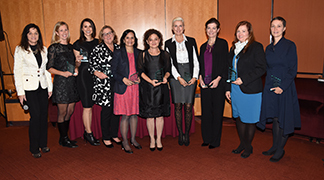 Annette Wilkus, FASLA, RLA was honored by Sokol Media in its 16th annual ‘Top Women in Real Estate 2017’ Special Edition published in September. The goal of the special edition is to advance the acknowledgement of women in Real Estate and Construction in New York. 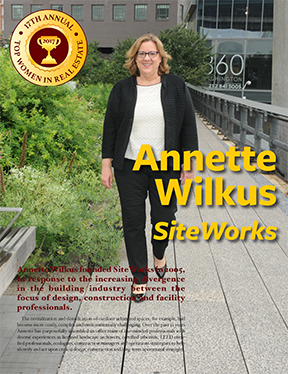 The five-page cover story highlights Annette’s accomplishments as Founding Partner of SiteWorks, a specialty landscape architecture firm, as well as a number of our notable projects including The High Line, Brooklyn Botanical Garden Native Flora Garden Extension, Queens Plaza Bicycle & Pedestrian Improvements, and Governor’s Island. SiteWorks staffers Julia Gold (l) and Cristina Cordero (r) both enjoyed the celebration honoring Annette. In September the SiteWorks staff enjoyed a full day of Nursery tours. The entire office went to central New Jersey and visited 3 Nurseries; Pinelands Nursery, Pleasant Run Nursery and Fernbrook Nursery. The day tour is sponsored by the 3 nurseries every other year. – Pinelands Nursey showed the group the complete production system and various varieties of potted shrubs and perennials. – Pleasant Run showed us their new containerized fields expanding their inventory from quart size to larger container shrubs. – Fernbrook guided us through their growing fields and showed difficult containers. While half the group went to the fields, the other half of the group received a beneficial soils primer course. 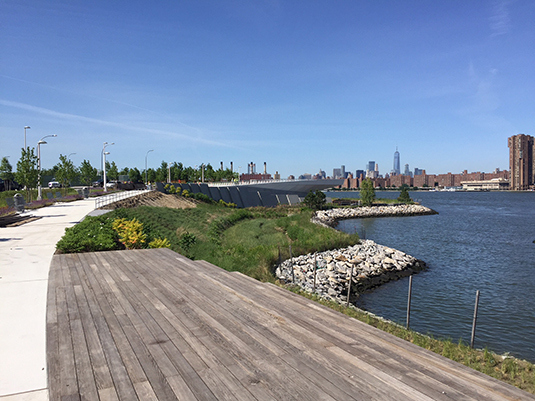 In May, SiteWorks visited Hunter’s Point South Phase 2 in Long Island City, NY, one of our projects in construction. 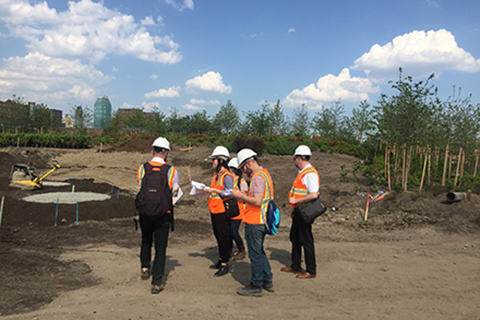 The staff walked the site with Senior Project Manager James Dudley and observed the status of the construction as well as the different types of plantings. James explained some of the issues that have been dealt with and the reasons for specific tree and plant species selection. Annette Wilkus and Andrew Lavallee, Partners, frequently arrange staff site visits, noting the tremendous teaching value for the office. They are dedicated to growing the staff and insuring a broad understanding of all SiteWorks projects, not just their own project. 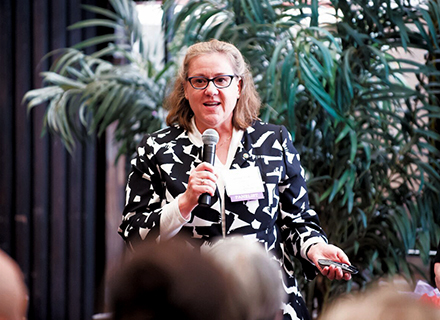 On May 23, 2017 Annette Wilkus, FASLA, RLA, Partner, was on the second panel of Building Parks 2017 Professional Women in Construction Parks Panel. 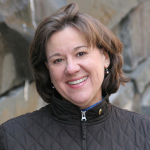 The keynote speaker was Therese Braddick, Deputy Commissioner NYC Parks and Recreation. The first panel was ‘Perspectives from the Public Realm’, while the second was ‘Perspectives from the Designers’. Joining her on the panel was Molly Burne from MNLA, Lisa Tziona Switkin from James Corner Field Operations, Donna Walcavage from Stantec and Moderator Susan Chin from the Design Trust for Public Space. Annette presented our work as support to designers offering technical, operations and maintenance documents and eyes and ears on construction sites. 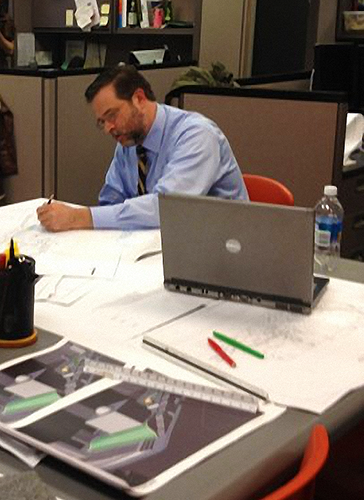 As Landscape Architects, our firm promotes better implementation of innovative designs. 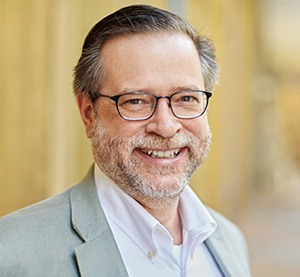 We are pleased to welcome Blair Guppy to SiteWorks as a Senior Landscape Architect. He joins the firm with over 15 years of experience in award winning and innovative projects. He possess both international project management skills and technical expertise allowing him to creatively resolve issues and complete projects on time and within budget. Blair is skilled at writing technical documents and procedures in a clear and concise style. His management style is motivating and flexible. We are all looking forward to working with him. 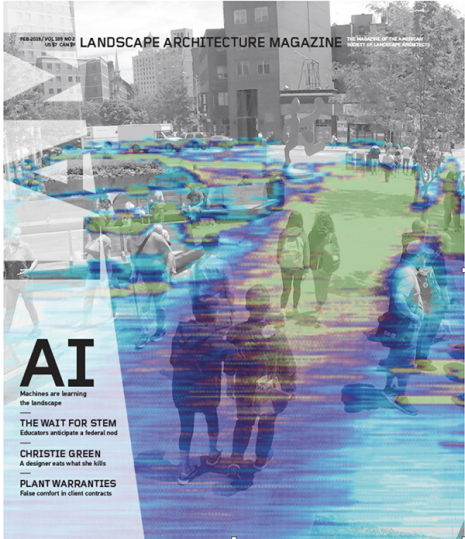 In April, Andrew Lavallee, FASLA, RLA, Partner, lead two green infrastructure panel discussions at the Rising Urbanists: Green Infrastructure for the 22nd Century Conference hosted by the New York ASLA and the Student ASLA Chapter from City College. The first panel entitled “How Can We Design Green Infrastructure with Greater Impact?” included guest speakers Rebecca Hill from RAFT Landscape Architects, David Seiter from Future Green Studio, Eric Rothstein from E-Design Dynamics and Thomas Reeves from FXFOWLE. The second panel entitled “How Can Green Infrastructure Engage More People and Places?” included guest speakers Shaun O’Rourke, Green Infrastructure Director with The Trust for Public Land, Jason Smith, Biodiversity Ecologist with the NYC Department of Environmental Protection, Lindsay Campbell with the USDA Forest Service, NYC Urban Field Station and Thomas Rainer, Co-author of Planting in a Post-Wild World. Annette P. Wilkus and SiteWorks are pleased to announce effective January 1, 2017, Andrew R. Lavallee has joined her as a Partner in SiteWorks Landscape Architecture. Andrew joined SiteWorks in January 2015 as the Director of Strategic Planning. His broad experience with high profile, interdisciplinary landscape projects has enhanced our specialized construction management and design practice. Andrew has expanded our portfolio to include site operations and maintenance planning services assisting our clients with strategies to improve the full life-cycle performance of their landscape facilities. 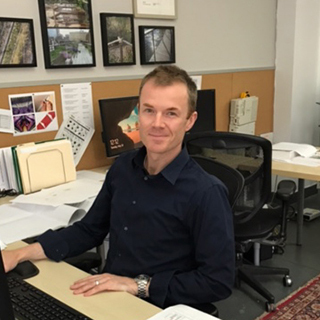 Andrew’s experience as a teacher at City College’s Landscape Architecture program has proven invaluable in the mentoring of new and junior staff. Andrew has been challenging our staff to achieve new and higher levels of accomplishment. 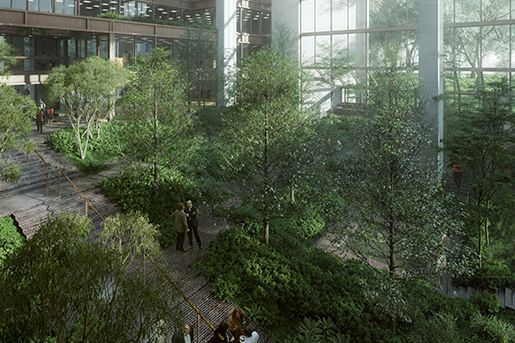 SiteWorks is proud to announce we are working with Raymond Jungles, Inc. (RJI) and the Gensler Architecture team on the renovation of the Ford Foundation’s interior atrium garden. In December 2015, the Ford Foundation announced that it is embarking on a $190 million mission-driven renovation of its landmark New York City headquarters, creating a global center for philanthropy and civil society. As part of the project, the atrium plantings and fountain will be fully restored to the spirit of the original Dan Kiley design, an innovative atrium public space designed in 1964. SiteWorks is working closely with the RJI team providing technical consulting for the interior planting environment, landscape cost estimating, constructability reviews, plant procurement and resident landscape architecture services during construction. The anticipated project completion date is summer 2018. SiteWorks with LiRo, is proud to have been chosen by The Trust for Governors Island to provide Facilities Management and Construction Management Services. This 5 year project’s charge is to manage, maintain, make improvements to and increase the efficiency of operations on the 172 acres Island. As the visitor attendance continues to grow and the landscape matures, the Maintenance and Operations of the Island’s open space will require adjustments. This demands a team with diverse capabilities and the ability to quickly adapt to what needs arise as Governors Island evolves. SiteWorks has been working on Governors Island since 2012 and has seen and understands the realities of the Island and has been successful in adapting to unforeseen needs. SiteWorks will start this process by evaluating the current needs and anticipate the Park’s future requirements including staffing costs and equipment. An inventory of current and new facilities, equipment and vehicles as well as mapping the as built will set the base and allow for a predictive approach and planning. Sustainability initiatives will be included in the Maintenance and Operations plan to improve long-term efficiencies, environmental performance and educational opportunities. SiteWorks goal is to help The Trust for Governors Island move towards increased operational predictability, sustainability, and accountability as the facilities continue to mature and expand over the term of the contract. At the ASLANY 2016 Design Awards, SiteWorks received a Merit Award for Collaborative Design for P.S. 111M, New York, NY: Run On, Run Off; A Green Infrastructure Playground and Community Park. The project needed a versatile, multi-purpose green infrastructure system capable of managing and infiltrating a five year storm event, while simultaneously providing an inclusive and durable playground for students and the neighborhood as well. The three month participatory design curriculum, a collaborative effort between SiteWorks, the Trust for Public Land and approximately one hundred dedicated and insightful students. The SiteWorks design team, led by Project Manager Josh Price and former Principal Melissa Potter Ix, incorporated elements of waterways and their flora and fauna, as the theme for the new park. In addition to the active recreational components, which included a running track, multi-purpose field, basketball shooting stations, play equipment and ping pong, the park features a green roof gazebo, an outdoor classroom, stage, extensive student color seal art, multiple garden areas, and a woodland walk with native plants. Annette Wilkus is serving as a juror on the inaugural grant competition, sponsored by Anova Furnishings, to sponsor 21 young professionals to attend ASLA’s Annual Meeting in New Orleans. 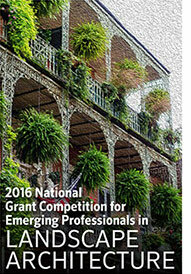 The grant competition is designed to accelerate individuals’ careers in Landscape Architecture. Eric Gilbert, CEO of Anova, believes education and sharing ideas drives personal growth and develops the idea. By attending the ASLA Annual Meeting young professionals are exposed to new ideas and networking. The Jury consisting of Annette, David Hill and Ellen Stewart, helped to develop the competition’s submission criteria and are currently jurying the over 105 submissions. Individuals submitted a napkin sketch –critical to communicate during meetings and brain storming-, a 500 word explanation of an idea central to the individual’s region and a short summary of their regionally based idea. Andrew Lavallee, FASLA, RLA, Director of Strategic Planning, has been appointed to a five year term on the New York State Board of Landscape Architects. 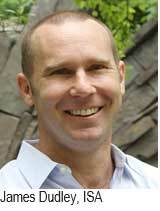 As a member of the board, Andrew will be helping to regulate the licensure and registration of landscape architects. He will also be assisting with the promulgation of qualifications for a landscape architect license and making recommendations regarding the granting, revocation or suspension of a license and registration to practice landscape architecture. Andrew and the SiteWorks team also participated in a technical peer review of the NYC DEC’s upcoming revised Stormwater Design Manual chapter on planting design for green infrastructure. 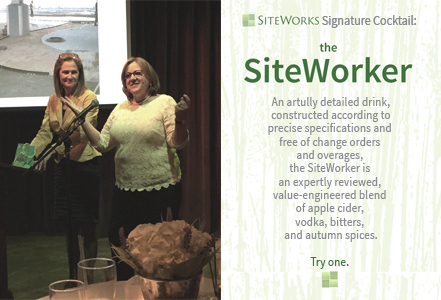 On October 8, 2015 SiteWorks celebrated its 10th anniversary with a spectacular event at Pier A in Battery Park. Staff, friends, clients and business associates enjoyed an evening filled with music, good food, laughter and many walks down memory lane. A photo journal was projected on multiple screens documenting SiteWorks project history. Annette Wilkus, founding Principal, and Melissa Potter Ix, Principal, both gave heart felt speeches thanking clients, families, friends and staff for their hard work and support throughout the years. In preparation of the event the office participated in a friendly competition to create a signature cocktail. The SiteWorker debuted during the celebration. 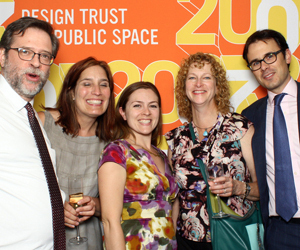 In October, The Design Trust for Open Public Space celebrated its 20th Anniversary. The Design Trust was founded in 1995 to unlock the potential of New York City’s shared spaces. Their unique project model brings together government agencies, community groups and private-sector experts to transform and evolve the city’s landscape. Andrew Lavallee, our Director of Strategic Planning and a Design Trust Fellow, joined in the celebration. He is pictured on the far left with his fellow co-authors of the Trust’s “High Performance Landscape Guidelines: Parks for the 21st Century”. SiteWorks recently started work on 2 new schools for the New York City Playground Program, PS 189 Flushing International School in Queens, NY and PS 154 in Harlem, NY. SiteWorks has begun the 3 month participatory phase, working closely with the Trust for Public Land team. The process is an integral part in the success of the project as it allows all parties to be active participants in the design of their new playground and playground stewards once the projects are completed. 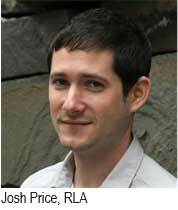 Will Johnson, Associate, was a panel member at the ASLA annual conference in Chicago in early November. The panel, titled ‘The Owner, the Designer the Construction Manager-Three landscape architects shape Governors Island’ showcased three separate paths the panel members have chosen for their career and the collaboration they worked toward to achieve the realization of the design. The scale of the project, the historic significance of the island; its location in the middle of New York Harbor and the unavoidable impact of climate change and anticipated rising sea levels, all of these have combined to make this project a test case for new ways to approach planning, design, construction management and land stewardship. The panel members discussed their separate roles as they participated in this multi-year project. Will’s knowledge of being on the island for the past three years and his innate ability to collaborate was well received and appreciated. PS 161 Q, the Arthur Ashe School, located in Queens, NY, opened in November with a celebration that included musicians and musical and dance numbers by the students. The community and fund raisers were on hand along with SiteWorks, Trust for Public Land, NYC Environmental Protection, the School Construction Authority, and the Department Education, all part of an innovative partnership, facilitating the New York City Playground Program. 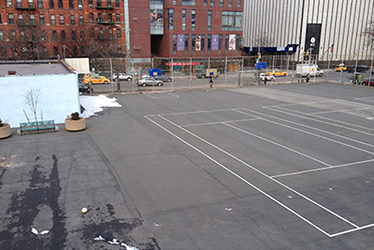 PS 161Q celebrates community and history in homage to the school’s name sake, Arthur Ashe, with a tennis court designed to encourage the students to stay physically active. The new playground also boasts a running track, basketball shooting stations, planted garden beds and an outdoor classroom. 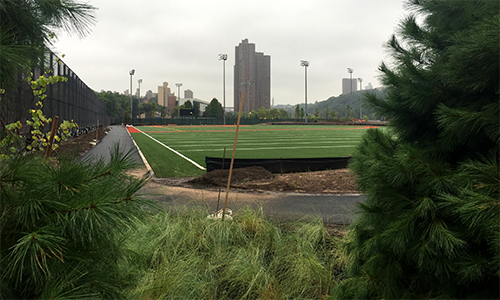 The turf field, which can be used for soccer and football, captures and manages most of the playgrounds stormwater— continuing the mission to alleviate the stress on the combined sewer system on all the newly designed playgrounds. The first phase of this 6 block open space designed by MVVA opened in October in conjunction with the completion of the No. 7 Subway Extension. As part of the construction management team, SiteWorks fostered the landscape architectural elements through construction. Extending from West 33rd to West 39th Street this 6 block open space is lined with boulevards on the east and west. The first phase from West 33rd to West 36th accommodates two entrances to MTA’s new No. 7 Subway Extension. The first block (33rd to 34th) is a respite from traffic and holds one of the new MTA entrances. Block two (34th to 35th) will cool and soothe pedestrians with the fountains winding through the block and second MTA entrance. The third block (35th to 36th) holds an innovative playground and cafe. The park will be connected to the High Line by the new Hudson Yard development once that is completed. The PS 111M Hell’s Kitchen schoolyard opened in June to great accolades from the community and the project funders. This project is part of an innovative partnership between the Trust for Public Land, NYC Environmental Protection, the School Construction Authority, the Department of Education, school students, and the community to construct Green Infrastructure Playgrounds from asphalt lots. Inspired by the native streams and wetlands that once occupied this area of Manhattan, as well as the school’s current proximity to the Hudson River, the SiteWorks participatory design team, led by Principal Melissa Potter Ix and Project Manager Josh Price, incorporated elements of waterways and their flora and fauna, as the theme for the new park. In addition to the active recreational components, which included a running track, multi-purpose field, basketball shooting stations, play equipment and ping pong, the park features a green roof gazebo, an outdoor classroom, stage, extensive student color seal art, multiple garden areas, and a woodland walk with native plants. PS 111M not only celebrates the Hudson River through its design, but it helps to keep it clean by incorporating green infrastructure initiatives. The first 1” of stormwater that falls on the site is absorbed naturally into the ground, as rain gardens and sub-surface gravel infiltration beds prevent runoff from entering New York’s combined storm-sewer system. Annette Wilkus was a member of a panel discussing ‘Art in the Landscape’ on Sunday June 14 at the National Arts Club. Annette presented construction sequencing photos of several areas of The High Line’s Section II. 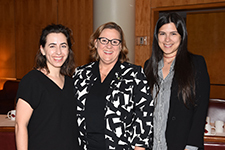 Included in the panel was Melanie Sifton, VP of Horticulture at the Brooklyn Botanic Garden, and Nancy Buivid of Battery Park City Parks Conservancy. The common thread through the discussion included all projects SiteWorks has been a part of. 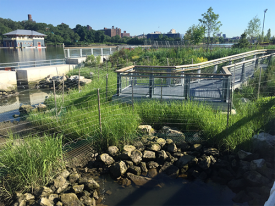 Melanie touched on Brooklyn Botanic Garden Native Flora Garden Extension- which SiteWorks designed in collaboration with Darrel Morrison, as well as Teardrop Park and The High Line which are two of SiteWorks’ construction management projects. SiteWorks is proud to announce our receipt of the 2015 New York ASLA Merit Award for the Brooklyn Botanic Garden New Native Flora Garden Extension, Brooklyn, NY. 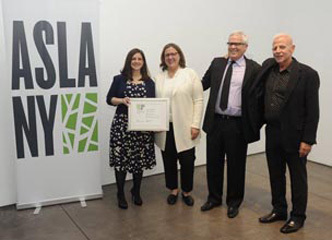 Annette Wilkus, Founding Principal, accepted the award from Jennifer Nitzky, President ASLA NY with the collaborating designer, Darrell Morrison and Scot Medbury, President Brooklyn Botanic Garden. The Beverly Willis Architecture Foundation received grants from the New York Council for Humanities and the New York Building Foundation to identify 100 outstanding structures and built environments in New York City, contemporary or historic, designed and/or constructed by women. The structure or built must have a woman who was directly responsible for leading the design (architectural, engineering or landscape) or who led the construction, either from the development or construction management team. 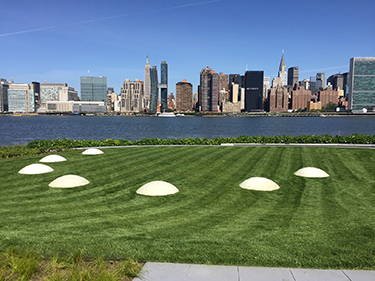 SiteWorks is proud to announce Annette Wilkus received a Built By Women Award in the Landscape category for her work on Governors Island. Over the next year, walking tours, interactive maps and other educational materials will be developed to highlight women’s contributions to the built environment and the Beverly Willis Architecture Foundation will host local events to publicize the spaces. SiteWorks Landscape Architecture, a landscape architecture and construction management firm located in New York City, is pleased to announce the addition of Andrew Lavallee FASLA to our team. 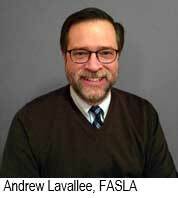 Andrew Lavallee is a professional with over 25 years’ experience in all technical aspects of our profession. As the Director of Strategic Planning, Andrew’s broad experience with high profile, interdisciplinary landscape projects will enhance our specialized site operations and maintenance planning services, assisting our clients with strategies to improve the full life-cycle performance of their landscape. As a recognized leader in the application of innovative green infrastructure strategies for cities Andrew co-authored the award-winning High Performance Landscape Guidelines: 21st Century Parks for New York City (2011). Andrew is a frequent speaker at landscape architecture conferences and has authored numerous articles on a variety of technical subjects ranging from sports facility design to the development of economically sustainable parks. In addition to our new team members, SiteWorks is pleased to announce James Dudley ASLA recently completed his arborist exam and is ISA certified and Josh Price ASLA successfully completed the LARE and is now a registered landscape architect. Annette Wilkus and Melissa Potter Ix, attended the ASLA convention’s many interesting and informative workshops. Annette also presented as a panel member of Soil Biology: Make It Integral to Your Living Landscape, which was received with much enthusiasm. This was also the year Annette stepped down as Vice President of Professional Practice, passing the baton to Hunter Beckham. Highlights of the annual meeting included honoring The Trust for Public Land for their unparalleled service to the Landscape Architectural profession as they celebrated William Rogers, Honorary ASLA being awarded the La Gasse Medal, Adrian Benepe being awarded the Olmsted Medal and Mary Alice Lee becoming an Honorary ASLA member.